In spring 2012, every tree included in the monitoring programme was provided with markings to enable stem increment measurements as in forest observation plots. 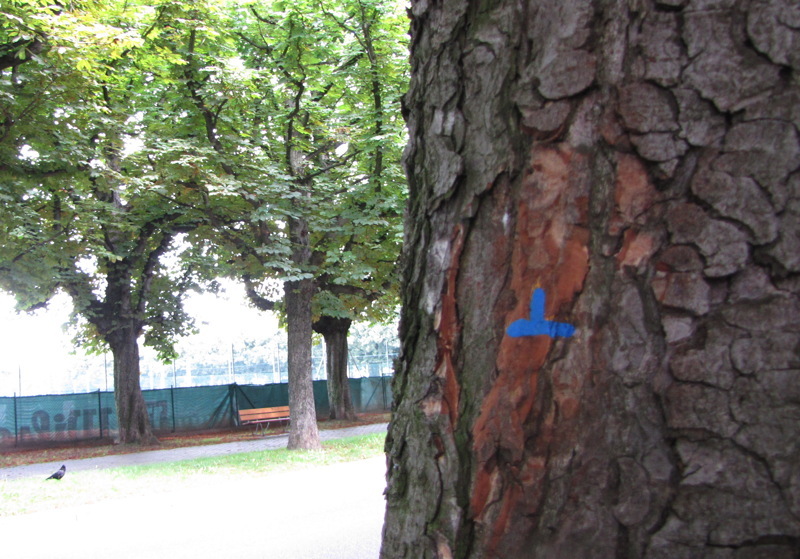 Marking on the tree used to measure stem increments. In 2014, the first stem increment measurements were carried out. Compared to tree growth in forest observation plots, the growth of urban trees is surprisingly low. For spruce and beech in forest observation plots we measured an average basal stem area increment of 33.3 and 26.8 cm² per year, respectively. In the city, such increments were only recorded for European nettle trees. Reasons for the low increments are soil compaction and high road salt loads during winter. There is also a relationship between stem increments and foliage damages due to road salt. each tree species between 2012 and 2014.